Vote HempNewshemp-newsWhy is CBD everywhere? It’s hard to say the precise moment when CBD, the voguish cannabis derivative, went from being a fidget spinner alternative for stoners to a mainstream panacea. Maybe it was in July, when Willie Nelson introduced a line of CBD-infused coffee beans called Willie’s Remedy. “It’s two of my favorites, together in the perfect combination,” he said in a statement. So the question now becomes: Is this the dawning of a new miracle elixir, or does all the hype mean we have already reached Peak CBD? The ice caps are melting, the Dow teeters, and a divided country seems headed for divorce court. Is it any wonder, then, that everyone seems to be reaching for the tincture? 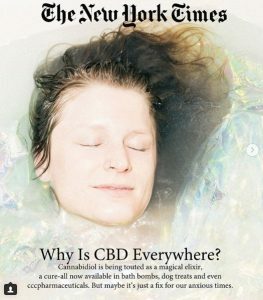 With CBD popping up in nearly everything — bath bombs, ice cream, dog treats — it is hard to overstate the speed at which CBD has moved from the Burning Man margins to the cultural center. A year ago, it was easy to be blissfully unaware of CBD. Now, to measure the hype, it’s as if everyone suddenly discovered yoga. Or penicillin. Or maybe oxygen. Even so, you ask, what is CBD? Plenty of people still have no idea. CBD is short for cannabidiol, an abundant chemical in the cannabis plant. Unlike its more famous cannabinoid cousin, THC (tetrahydrocannabinol), CBD does not make you stoned. Which is not to say that you feel utterly normal when you take it. Moreover, you are unlikely to find yourself microwaving frozen burritos at midnight after taking CBD, unlike with pot. Such quasi-religious talk is common among CBD’s disciples. Such testimonials make CBD seem like a perfect cure for our times. Every cultural era, after all, has its defining psychological malady. This also means that every era has its signature drug. The jittery postwar era, with its backyard bomb shelters and suburban fears about keeping up with the Joneses, gave rise to a boom in sedatives, as seen in the era’s pop songs (“Mother’s Little Helper,” by the Rolling Stones) and best sellers (“Valley of the Dolls,” by Jacqueline Susann). The defining sociological condition today, especially among millennials, is arguably anxiety: anxiety about our political dysfunction, anxiety about terrorism, anxiety about climate change, anxiety about student loan debt, even anxiety about artificial intelligence taking away all the good jobs. The anxiety feels even more acute since the wired generation feels continuously bombarded by new reasons to freak out, thanks to their smart devices. What a convenient time for Mother Nature to bestow a perma-chillax cure that seems to tie together so many cultural threads at once: our obsession with self-care and wellness, the mainstreaming of alternative therapies and the relentless march of legalized marijuana. “That seems like a gift in these times,” Ms. von Pfetten said. The tsunami of CBD-infused products has hit so suddenly, and with such force, that marketers have strained to find a fitting analogy. Chris Burggraeve, a former Coca-Cola and Ab InBev executive, called it the “new avocado toast,” in an interview with Business Insider. Then again, avocado toast seems so five years ago. It would be false to suggest CBD is nothing more than an obsession for reiki-adjacent bicoastal millennials. According to the AARP website, CBD has become a popular treatment for pain and arthritis among baby boomers, some of whom may have been out of the cannabis game since they rolled their last doobie at a Foghat concert in 1975. Such sumptuously packaged, premium-priced CBD products appeal to trend-conscious consumers in part because they promise a degree of indulgence — without the indulgence. Despite its cannabis origins, CBD is not marketed as a recreational drug, but almost as its opposite: as a corrective to the ill effects of alcohol and even marijuana itself, which makes it catnip for hard-charging professionals who need to be fresh for a 7 a.m. breakfast meeting. A detox drink under development called Sober Up, for example, will contain CBD and is supposed to support liver health and help prevent hangovers. When added to dishes like sesame shrimp toast at PopCultivate, a series of cannabis-centric pop-up dinners in Los Angeles, CBD (which is flavorless) can function as a social lubricant, just like a wine pairing, but without, according to proponents, the hangover. “You become more engaged with your neighbors, talk more freely, and meet more people you dine with,” said Chris Yang, the molecular biologist turned chef behind the series. “I replaced my entire beauty routine with only CBD products,” read a recent headline in Glamour magazine. This earthy, artisanal aura plays well with devotees of, say, Goop, who are already conditioned, after years of aromatherapy, cryotherapy and homeopathy, to accept a natural wellness mantra over anything on offer by Big Pharma and the medical industrial complex. Such concerns seem to have helped fuel the CBD movement. In an era marked by a loss of faith traditional institutions (governments, banks, hospitals), CBD has flourished, perhaps because it seems new, mysterious and untainted by the mainstream. It may or may not be a coincidence that one of the best-known CBD retailers in New York, the Alchemist’s Kitchen in the East Village, serves up cannabidiol tinctures and gel caps, alongside workshops on astrocartography, lucid dreaming and full-moon ancestral healing. Snake Oil or Wonder Drug? There’s one problem with that approach. When people turn to CBD-infused coconut lattes to cure acne and erectile dysfunction, it is not easy to separate hype from science. Skeptics who assume CBD is just 21st-century snake oil, however, may be surprised to learn that the substance is being studied as a potential treatment for maladies as diverse as schizophrenia, insomnia and cancer. The National Institutes of Health database lists about 150 of studies involving CBD as a treatment for conditions as varied as infantile spasms and Parkinson’s disease. And the research has led to medical treatments. In June, the Food and Drug Administration approved a cannabidiol-based drug called Epidiolex as a treatment for severe forms of epilepsy, representing the first government-sanctioned medical use for CBD. Preliminary research also indicates that CBD may be effective as an antipsychotic in reducing the symptoms of schizophrenia, with fewer side effects compared with current antipsychotic drugs, Dr. Blessing said. That’s not to say that a CBD-laced gummy or two should be considered medicine. There are legal hazards as well. As with all cannabis products, the federal government categorizes CBD products other than Epidiolex as a Schedule 1 drug, like heroin, according to the Drug Enforcement Administration. And cannabis remains illegal under federal law, even in states that have legalized marijuana for medical or recreational use. Although there have been scattered raids of CBD retailers around the country, several states, including Alabama, Texas, Florida and Oklahoma, have passed laws approving specific CBD products to treat specific ailments. And CBD shops have cropped up nationwide, in Los Angeles, Oklahoma City and Austin, Tex., to name just a few cities. Aside from a federal crackdown, the only thing that may eventually kill CBD’s momentum is hype itself, said Mr. DeLand of Dosist. The frothy claims about CBD “sets up some false expectations that the molecule will never be able to live up to,” Mr. DeLand said. Not only are questionable claims an invitation for government regulation, but they risk making even legitimate applications seem dubious, he said. This content is from the New York Times.